In a large pan on medium-low heat, cook the olive oil and the onion for about 3 minutes until the onions have started to wilt. Add the fresh parsley and shitake mushrooms and continue to sauté for another 3-4 minutes. Add salt and pepper and mix well with wooden spoon, scraping the bottom of the sauté pan. Add the chopped chicken to mushroom mixture, mixing well. When the chopped chicken starts turning white, add the matzo farfel. Mix well. Add the egg and mix until the egg disappears in mixture. Add the chicken stock. Raise flame to medium-high. Let chicken and mushroom mixture simmer for about 10-15 minutes until liquid evaporates. Set aside to cool off. On a cookie sheet or roasting pan spread a thin layer of olive oil to coat the bottom of the pan. Lay your portobellos top down onto the sheet. Sprinkle a little salt and pepper and roast in the oven for about 15 minutes. Mushrooms will shrink slightly. Remove from oven and let cool slightly. Sauté the olive oil and onions together in a pan over medium-high heat. When the onions start to wilt, add the mushrooms and mix well with wooden spoon. Sauté for about 5 minutes. Add the whip topping and wine to the mixture and bring to a boil. When sauce starts to boil, lower the flame and add the potato starch. Mix constantly until mixture thickens about 2-3 minutes. 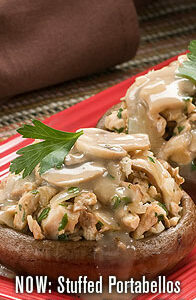 To stuff the mushrooms, add heaping spoonfuls of pilaf mixture into the bottom side of portobello mushroom. Pour sauce over and serve warm..